GTA Online has a new super-fast car. That’s about it-we can safely say that this car is not really just complement your collection and will become its decoration. Well, Christmas is behind us, and if you haven’t managed to waste all of your money, then meet is Lampadati Viseris. 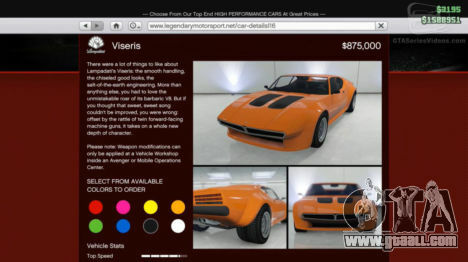 This car is already available to all players in Legendary Motorsport for a mere 875 000$ in-game currency. Not too high a price for such beauty. 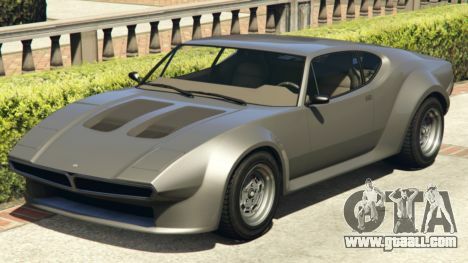 You can purchase Lampadati Viseris in different color variations, and, depending on your taste and color, to select additional modifications, for example, by mounting on the hood a couple of machine guns. Viseris speeds up to 235 km/h. This car also good in terms of handling. In short, no doubt – high quality budget car with a powerful eight-cylinder engine and pop-up headlights, which, if desired, you can upgrade in the shop for Avenger the way you want.